It’s the 1960’s in New Jersey, home to the finest prisons in America; if you walk among the streets you might find yourself amongst the curse words, shootings and scams. You have to be a real tough guy. And yet, beyond the crime and heartache, four guys with extraordinary muscial talent came together to form Frankie Valli and the Four Seasons. With an Olivier Award for best new musical, Jersey Boys allows the audience to follow the rise (and some falls) to fame of such an iconic group. Lead by singer Frankie Valli, who is famous for his distinctive falsetto, The Four Seasons tackle rejection, disagreements and debts. The muscial is performed in a documentary fashion, separated through actual seasons, with each member of the group contributing to the telling of their story: Tommy Devito (Simon Bailey) shares his wise experiences from in and out the walls of prison, often acting very blasé about some pretty serious situations. Bob Gaudio (Declan Egan) carries an innocent yet intellectual persona with a voice which I found you could easily be charmed by. Nick Massi (Lewis Griffiths) didn’t really say much but what he did input was quality comedy. As I am no stranger to this muscial tour I was definitely pleased to see Griffiths and his variety of facial expressions return to the stage as Massi on bass. And last but by no means least Frankie Valli (Michael Watson) performs hit after successful hit which is compromised by a rocky rise to fame and struggles of his family life. 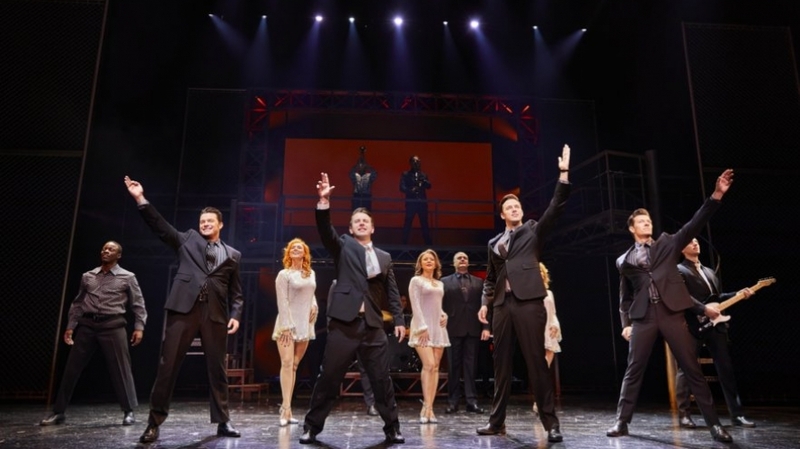 Jersey Boys premiered in 2004 and has since soared to success winning 57 notable awards. Obviously the music needs to be mentioned as the cast performed the classic hits of The Four Seasons such as “Big Girls Don’t Cry”, “Sherry” and “December 1963 (Oh, What A Night)”. They delivered these numbers in a slick fashion, accompanied by rhythmic foot tapping, clicking and guitar swinging by Nick Massi and Tommy Devito. The metallic set, designed by Klara Zieglerova, of stairways and balconies became the backdrop of bars, casinos and bowling alleys to depict the superficial luxury lifestyle of the Four Seasons. While contributing to the creation of this muscial Frankie, Bob and Tommy expressed in an interview that a lot of their troubles, or getting into trouble, was swept under the rug in order to secure their chance of fame. However, sharing their true story with all the highs and lows is what makes Jersey Boys such a success. Having seen this Musical before it was easy to come with very high expectations, and it certainly didn’t disappoint. The musical soundtrack alone is more than enough to please any audience but it’s the story behind the music which really touches your heart. Jerseys Boys received a roaring applause from the audience, although I didn’t want it to end as I could continue to watch again and again.